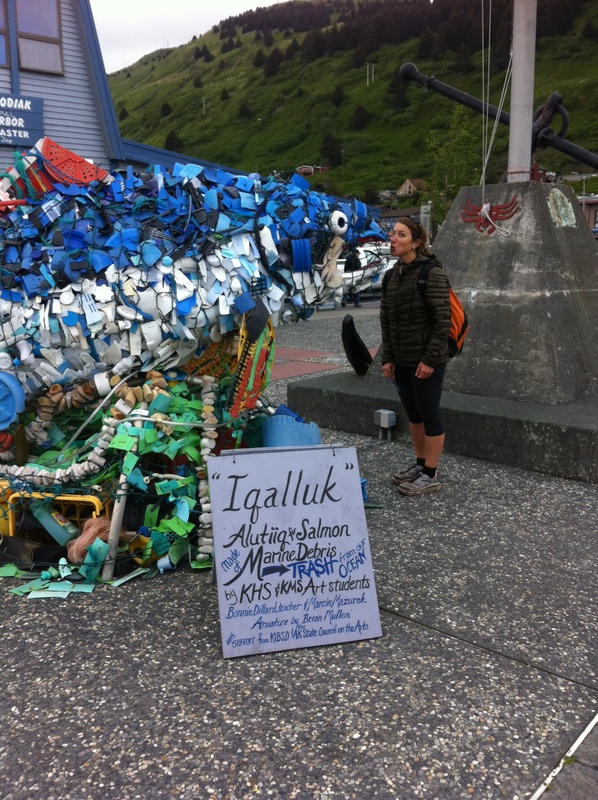 During my first several days in Kodiak, I spent as much time as possible exploring the island on foot. 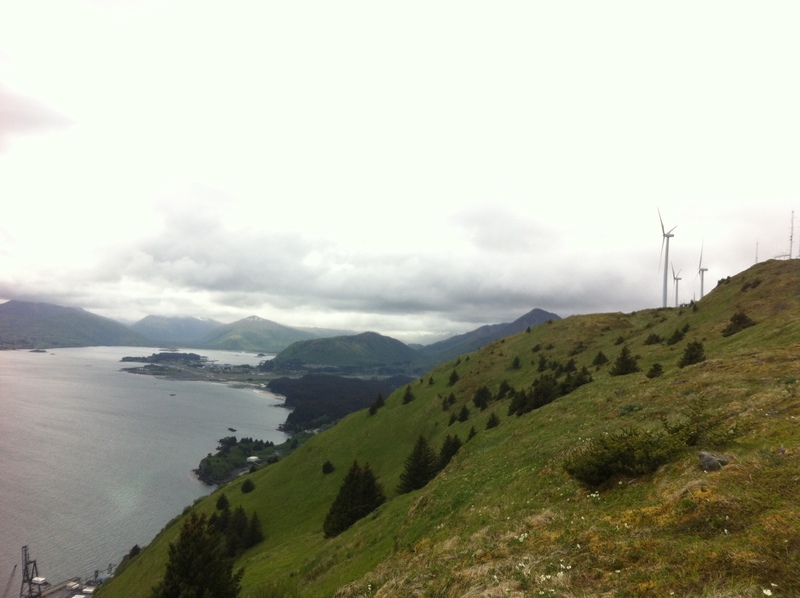 I hiked up Pillar Mountain to the wind turbines which now help to make Kodiak virtually 100% renewably powered; 14% comes from these turbines while the bulk of the electricity is generated by Terror Lake hydro-power facility located within the interior of the island. The hydro and wind generation replaced a diesel powered generator and resulted in many benefits to the town and our atmospheric global commons. The idea of a global commons is one I spend a lot of time discussing in the first days of my environmental science course. The Global Commons includes resources or regions outside the political reach of any one nation state: the Atmosphere, Outer Space, Antarctica, and you guessed it…the High Seas! June is National Ocean Month – and the theme for this week is marine debris. I recently learned a new doctrine of mare liberum (free sea for everyone), but I’d like to add the latin word for responsibility, officium. Dumping wastes is commonplace with the mantra of “dilution is the solution to pollution” and this practice continues to create challenges in our oceans. Plastics pose a major threat to our marine life and NOAA is taking significant steps toward reducing plastic pollution through a variety of educational campaigns. Plastic marine debris can come from a variety of industrial and domestic products, as well as lost or discarded fishing equipment. Another challenge facing our Global Commons includes over fishing in the High Seas. Have you eaten Fish sticks, Filet-o-fish, Imitation-crab….otherwise known as Alaskan Pollock? My mother often told me she craved McDonald’s fish sandwiches while pregnant with me; perhaps those sandwiches somehow led me to this spot 20 miles off the Aleutian Islands? One of the main reasons we are on the Oscar Dyson for the next three weeks is to gather data on the Alaskan Pollock populations so that the fishery can be maintained at a sustainable level. This Alaskan Pollock commercial fishery is one of the most economically valuable and well managed fisheries in the world. Part of this success is due to the implementation of the MSA (Magnuson-Stevens Fishery Conservation and Management Act) that set up a system governing the EEZ (Exclusive Economic Zone – waters three to 200 miles offshore), and also established NMFS (National Marine Fisheries Service) under NOAA (you better know what this means). The UNCLOS (UN Convention on the Law of the Sea) provides international guidelines and law for our oceans. Acronyms…scientists and the military love them. I will learn to love them. 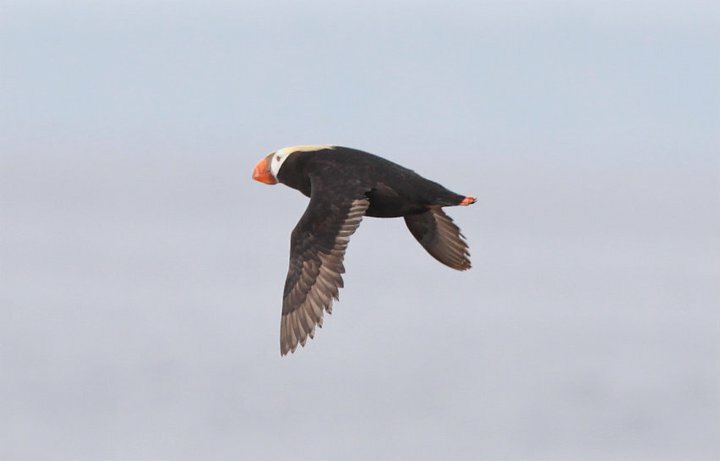 On the topic of marine debris, there are often jokes made on the bridge about the too-fat-to-fly puffins. They furiously flap their little wings in front of our ship. Apparently cribbage is the game to play on the Oscar Dyson and thanks to Emily Collins (fisheries biologist), I now have another card game to add to my repertoire. Ever tried to ride a stationary bike on a ship? The feeling is hard to describe and I must have a sensitive stomach because occasionally I feel as if I am on a roller coaster! Currently I am sitting in my stateroom listening to the sloshing ocean that gurgles and surges with the swell against the wall; the sounds are 95% soothing and 5% terrifying. I will not get sea sick and I will do my best not to become marine debris…. Did You Know? 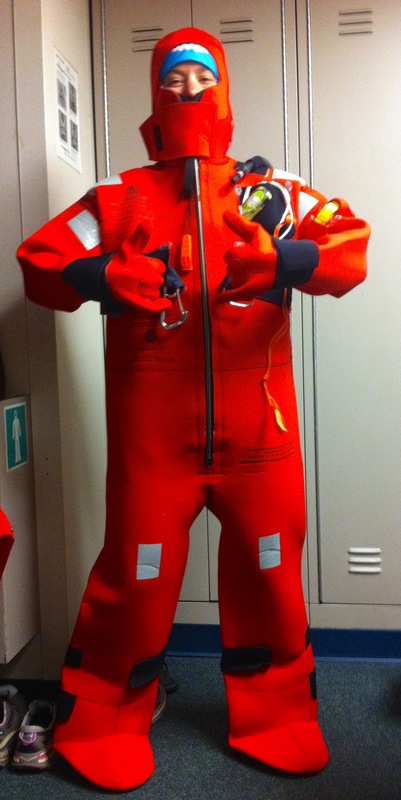 In the event that I have to abandon ship, my “Gumby suit” will help me survive the frigid waters of the Gulf of Alaska. Donning my Immersion “Gumby” Suit! Boarding NOAA Ship Oscar Dyson next week! Hello from Steamboat Springs, Colorado! This is my 7th year living in this spectacular Rocky Mountain town at 6,900 feet/2103 meters. I currently teach biology, geography, AP environmental science, and global politics at an independent high school called the Steamboat Mountain School. I love this little, adventurous school and feel fortunate to call our campus in the woods my home. As I finish up my teaching responsibilities at the end of the year and say goodbye to my talented, fun-loving, and hilarious students (a good sense of humor is requisite for teaching high schoolers), I always take time to reflect on how I can improve my craft as an instructor for next year. 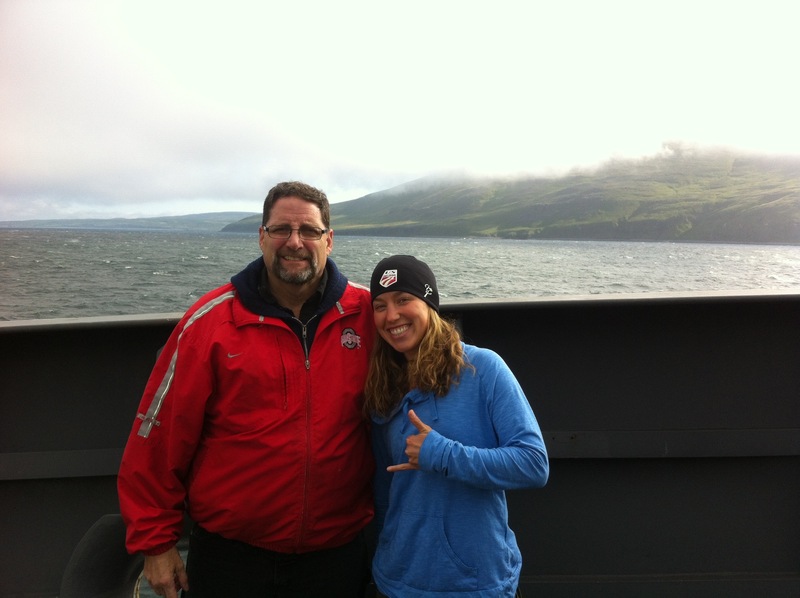 What better way to sharpen my inquiry skills than to live at sea with scientists for 20 days? I applied to the Teacher at Sea program looking for a top notch research experience to enrich my curriculum and obviously for the adventure this program affords me! I believe I first became enamoured with marine science as a young girl while exploring the beaches surrounding Buzzards Bay – it was here that I discovered the fascinating lives of horseshoe crabs! Did you know their baby blue blood contains a chemical superpower used to verify bacterial contamination in every FDA approved drug? In college at the University of Colorado, Boulder, I earned my degrees in biology and secondary science education. And before moving to Steamboat Springs, I lived in Maui, Hawaii with my family where I worked for the Pacific Whale Foundation as a naturalist. My time out on the ocean gave me an even deeper appreciation for the wonders of our water world. Every single day on the ocean is different from the next, full of surprises and new discoveries to be made. I am thankful and proud to become a member of the Teacher at Sea Program! 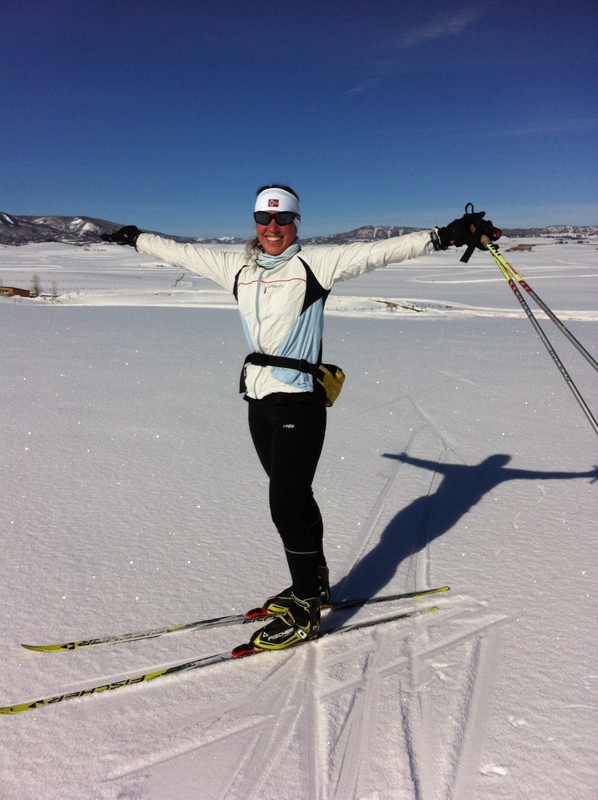 One of my passions: Nordic skiing! Currently, my courses conduct biodiversity plot studies, forest transects, monitor water and soil quality, record secondary succession in a fire mitigation area, and now have created a functioning aquaponics system with tilapia! Zip-grow tower from Brightagrotech in our greenhouse! Our tilapia live in an in-ground tank from which we pump water into a network of irrigation tubes (attached to a repurposed bed frame) that then waters eight Zip-grow towers. The fish excrement provides much needed nutrients for the plants and the fish are happy because their water is returned after being filtered through the plant root system. 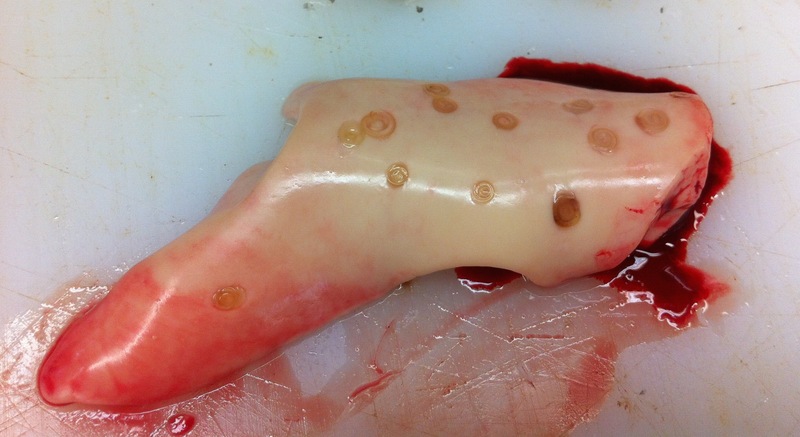 Farmed fish is beginning to play a significant role in our food supply. 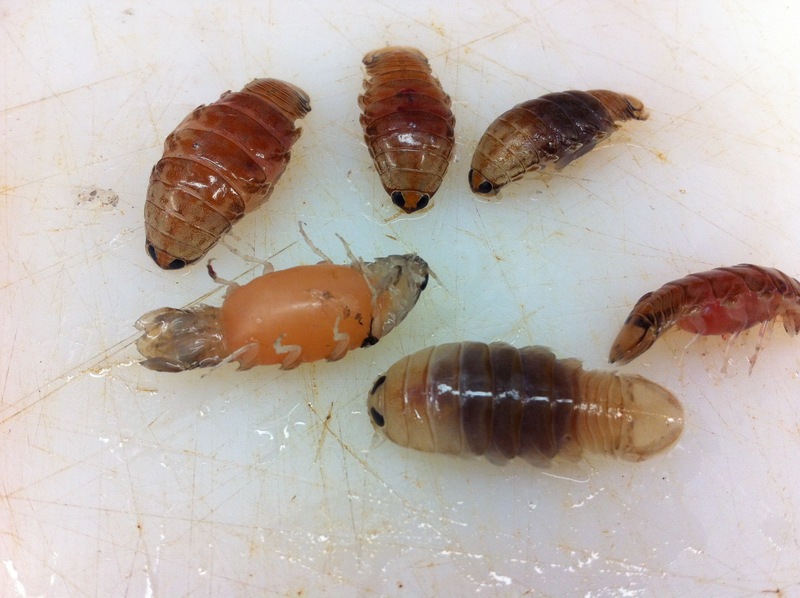 This brings me to a recent article in Outside magazine that I found quite interesting (thanks for sharing, David!). 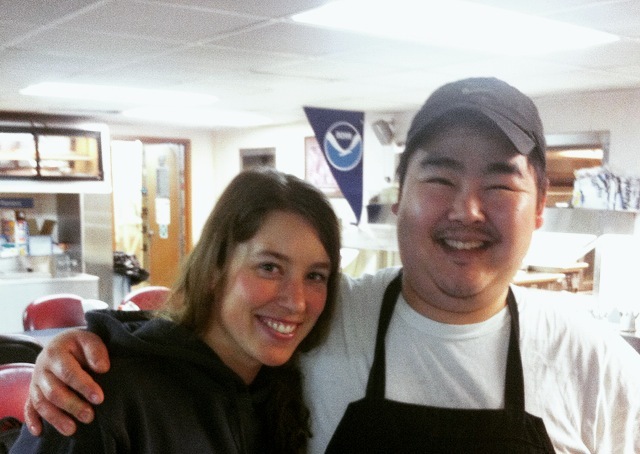 I look forward to learning more about how the health of the fisheries in Alaska are measured and what role the scientists on board believe farmed fish should or will play in our diet for the future. NOAA also has a great resource to help make decisions on our seafood choices. Please checkout the ship’s website for an overview of our mission. 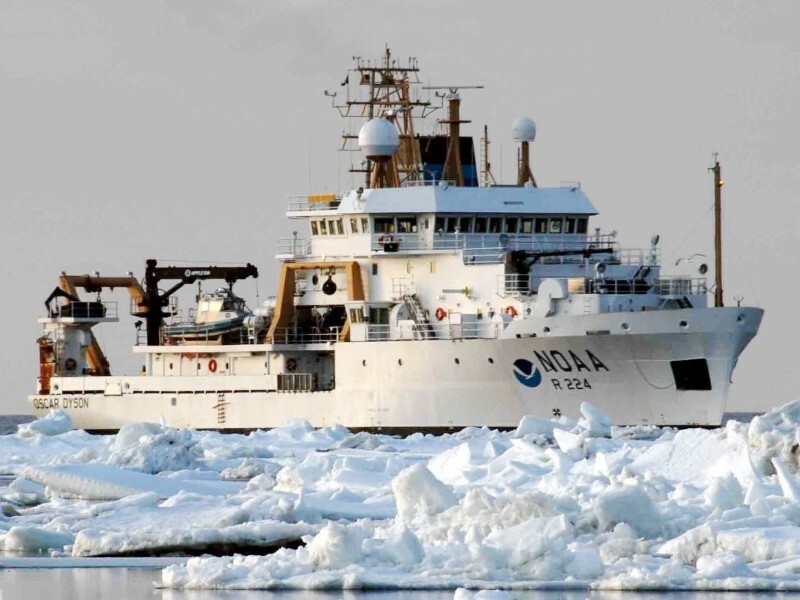 I head to Kodiak, Alaska on Monday, June 8th to meet the ship crew and scientists before we embark on our trip. Please send me comments, questions, and suggestions for my blog, I greatly appreciate your feedback. Time to start packing!